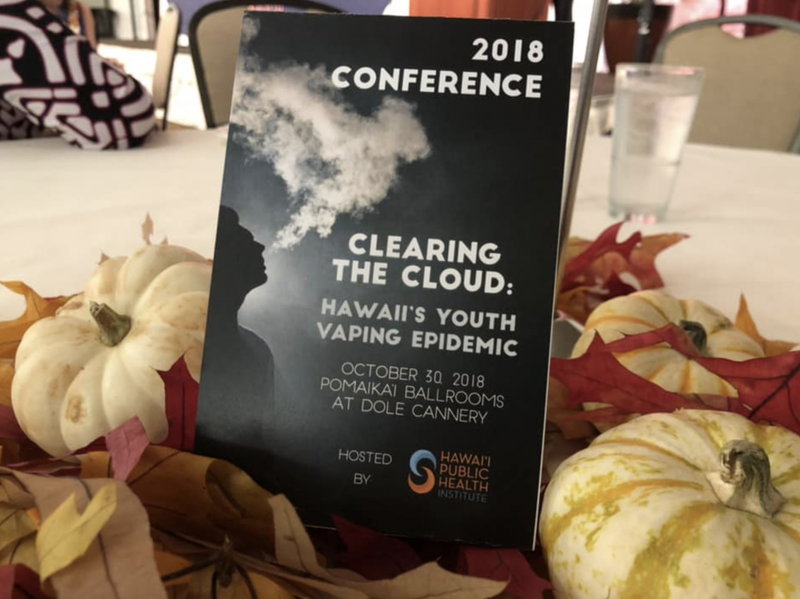 In late October, the Coalition for a Tobacco Free Hawai‘i (Coalition), a program of Hawai‘i Public Health Institute, along with the Hawai‘i Community Foundation and the Hawai‘i State Department of Health (DOH), hosted the state’s first-ever Electronic Smoking Devices (ESD) conference. Over 200 participants from various sectors, including education, law enforcement, state and city attorneys, and public health champions gathered to learn from national and local experts about the evolution and dangers of ESDs and how we can begin to reverse this epidemic. Our experts included: Dr. Brian King, Deputy Director of Research Translation – Office of Smoking and Health from the CDC in Atlanta; Dr. Bonnie Halpern-Felsher, Professor in the Division of Adolescent Medicine, Department of Pediatrics, who joined us from California at the Stanford University; Ms. Annie Tegen, Regional Advocacy Director – Western Region, Campaign for Tobacco-Free Kids; and Dr. Forrest Batz, HIPHI Board Member and former faculty from the University of Hawai‘i at Hilo School of Pharmacy. The conference also had breakout sessions focused on policy, counter-marketing, and school issues. With the growing prevalence of youth ESD use across our state in elementary, middle, and high schools, the Coalition and our partners felt that a conference specifically focused on increasing awareness, knowledge, and possible solutions to tackling ESDs was desperately needed in our state. Hawaii’s youth use rate is double the national average and, locally, we see elevated rates higher than 50 percent of high school youth ever trying ESDs in Hawai‘i and Maui counties. We are seeing keiki experimenting with vaping as early as the second grade, which demonstrates how successful the industry has been in marketing ESDs and hooking a new generation on nicotine. 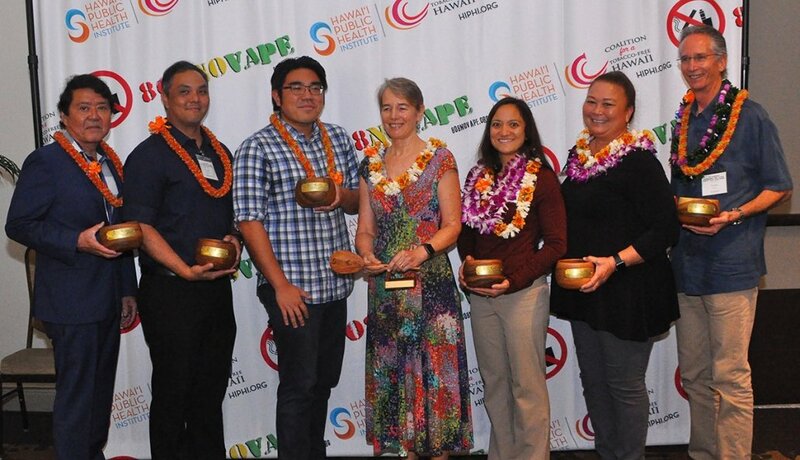 The ESD conference was an expansion of our annual Coalition Tobacco Stakeholders Meeting and honored seven Alaka’i Awardees. A special Lifetime Achievement Award honored former State Health Director Dr. Virginia “Ginny” Pressler. Lifetime Achievement Award: Virginia Pressler, former Director of the State Department of Health. Thank you to our staff and partners who worked tirelessly to pull this conference together in three short months. The Conference Planning Committee consisted of HIPHI staff on O‘ahu, the Big Island, Maui and Kauai, DOH, American Heart Association, American Cancer Society, and Dr. Forrest Batz. Thank you also to Hawai‘i Community Foundation and DOH for their support and on-site assistance on the day of the conference. To see the conference in pictures, visit our image blog.